Photo courtesy of Redwood Curtain Theatre. 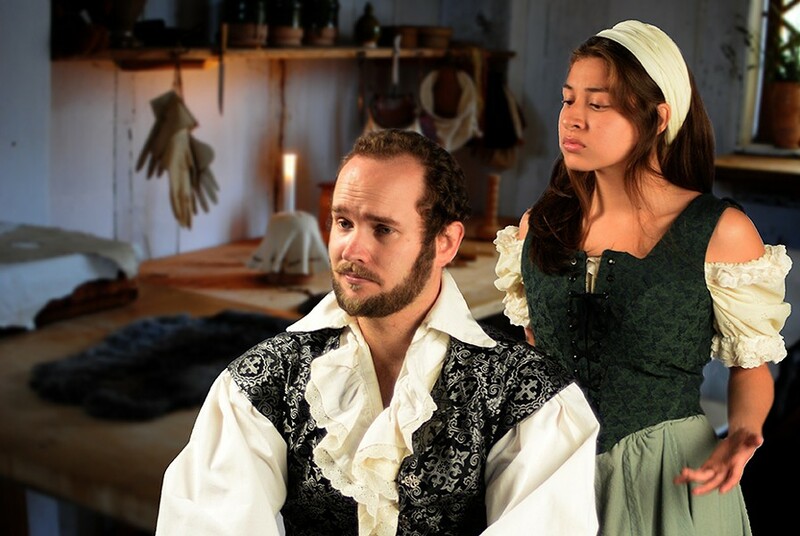 David Hamilton and Ambar Cuevas in Equivocation. It is 1606 and the chief minister to the new English king, James I, commissions the most popular playwright of the day to write a play about the notorious Gunpowder Plot that sought to blow up the Parliament building while the king and his family were there. That playwright is William "Shagspeare" — one of several ways Shakespeare's name was spelled by his contemporaries. The English weren't big on consistent spelling at the time. So begins Equivocation, now on stage at Redwood Curtain in Eureka. It is a comedy and a political whodunit, told in contemporary language (by a playwright who also wrote an episode of TV's political potboiler House of Cards) but set in the early 17th century: Shakespeare In Love meets All the President's Men. Shakespeare's sleuthing begins with a motive unknown to Woodward and Bernstein, or even Sherlock Holmes: He's worried that the official version of events just won't make a good play. For instance, the gentlemen conspirators were supposed to have dug a tunnel. How could they? It needed supports and pumps to keep the river out. And what did they do with the dirt? "There will be 700 penny-a-place standees at every performance, all of whom make their living with their hands," Shakespeare says. "And if there's anything these groundlings will want to know about, it's the dirt." But the bigger dramatic problem is that the plot was foiled, so the explosion didn't happen. What was good for the King is bad for Shakespeare, because the play has no ending. In search of theatrical reality, Shakespeare speaks with two of the alleged conspirators, and the play moves into the darkness of the time: political intrigue involving religion and the state, with the King's chief minister and spymaster, Robert Cecil, at its center. Shakespeare begins to wonder who profits from the Gunpowder Plot, and why. Equivocation is by Bill Cain, a Jesuit priest and writer who started a Shakespeare company in Boston. Another Jesuit (Henry Garnet) features prominently in the story, especially in regard to the concept of "equivocation" he championed: telling the truth, but indirectly. The moral questions raised by equivocation turn out to have significance for Shakespeare and his plays as well. Eventually Shakespeare completes a play, though not exactly the one commissioned, and it is the occasion for more mesmerizing action, including a sword fight. Prior knowledge of Shakespeare and these times isn't required, but it adds to the appreciation. Even more than usual for Redwood Curtain, the acting is excellent. This time the clarity and conviction of the acting are elevated as the actors meet the challenges of a witty, theatrical and multi-layered script. They respond with performances that rank among their best, at least in my experience. David Hamilton plays Shakespeare through the moods of his journey, revealing his humanity. Gary Sommers as the lead player Burbage and others, especially the Jesuit Garnet, is precise and evocative. James Hitchcock navigates both the wily Robert Cecil and Nate, the most grounded of the players, with economy and force. As both Richard Sharpe (the youngest player) and King James, Cody Miranda has a startling moment playing a scene between the two. With his posture and his eyes, he conveys the cruelty hidden in the cocksure king. The play also involves the central role of family, especially Shakespeare's relationship with his daughter, Judith, whose cynical skepticism is eventually transformed. Ambar Cuevas plays all those colors well, but her performance in the closing scene is exceptionally moving. The other elements of this production are equally admirable: the elegant and spacious set by Ray Gutierrez, dramatic lighting by Michael Burkhart and pleasing costumes by Jenneveve Hood, among other important contributors. Director Catherine L. Brown knits all these elements together into a convincing and entertaining world. Equivocation is on stage at Redwood Curtain weekends through Sept. 27. 443-7688, www.redwoodcurtain.com. On Thursday, Sept. 18, North Coast Repertory Theatre opens the 1991 comedy I Hate Hamlet (sensing a theme here?) by Paul Rudnick. 442-6278, www.ncrt.net. Also opening Sept. 18 is Beneath the Soulskin at Dell'Arte, a work-in-progress written and performed by Dell'Arte graduate Robin Shaw and directed by Michael Fields. "It's about the breaking of familial ties to the past, standing at the precipice of choice and choosing to leap," Shaw said. The show runs one weekend: Sept. 18 to 20 at 8 p.m. in the Carlo Theatre. 668-5663, www.dellarte.com.